Susan watching her Shark Tank episode air. Susan Petersen still remembers the day she and her husband, Christian, came home one Friday to find an $86 tax refund from the federal government. To say they were overjoyed would be an understatement. “You would have thought we won the lottery,” she says. “We were so happy. I thought we could buy anything we wanted we were so rich.” She and her husband ran to the bank, cashed the check, got dressed up and went to Chili’s for dinner. That was 2005. Susan and Christian had just gotten married and were living in Utah. The newlyweds were working while enrolled in college courses at the nearby University of Utah. College didn’t last long for Susan. (“I took a semester. I was bad at it,” she says.) Her job didn’t last long, either. The voice-over IP company where she was an executive assistant went under. And the timing couldn’t have been worse: she was pregnant. Susan knew she was going to have to get creative to make ends meet. Raised in a family of six on a single schoolteacher’s salary, she was well aware that, when times were tight, you found a way to make it work. At various points throughout her childhood, she’d waxed floors, delivered newspapers and sorted potatoes to earn money for her struggling family. There was no room for fear. Perhaps she didn’t realize it at the time, but her life experiences were priming her to launch a business. “I think as an entrepreneur, you really have get comfortable in the fear pocket,” she says. Shortly after giving birth to her daughter, Hattie, she was watching her friend make things and sell them online. By this time, in 2006, Etsy was the newest, hottest ecommerce company. Inspired, Susan learned how to sew, sewed a bunch of baby blankets and set up an Etsy shop. She quickly discovered that if she blogged about how to make what she was selling, that sent traffic to her store. To this day, she continues to make the most of social media, counting 400,000 followers on Instagram alone. When her second child, Gus, was born two years later, Susan wanted to buy him wee-sized moccasins but couldn’t find any that fit the image in her brain. Instead, she made her own using leather scraps picked up at a yard sale for $1. 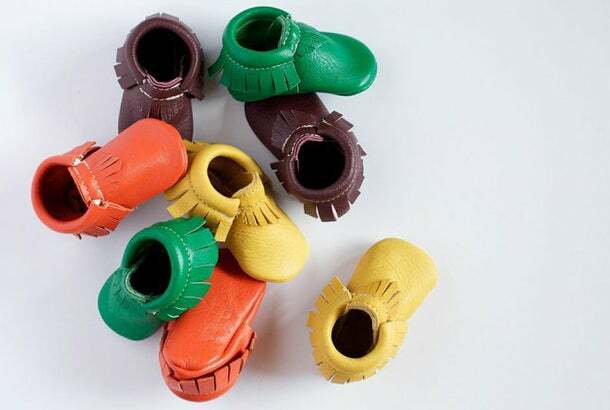 It was only after she blogged about the moccasins and received an outpouring of interest that she realized that baby moccasins might be a business idea. Little did she know then, but it was in that first bag of scrap leather that Freshly Picked was born. To come up with $200 to buy her first proper portion of leather, she spent a summer banging the glass out of old windows and collecting the metal frames to sell for scrap leather. Freshly Picked’s earliest sales came off of Susan’s Etsy page. Her first pairs of moccasins retailed for $20, but that was foolishly inexpensive. She didn’t understand how much work went into making a single pair and how expensive leather was. Today, her moccassins go from $45 to $60 a pair and range in colors from neon pink to dark green camouflage. In the last three years, Freshly Picked has grown from $120,000 in sales to $5.4 million in sales. Its staff has grown from one to 12. In January 2014, the company appeared on ABC’s Shark Tank and landed a deal with Daymond John -- $150,000 for 25 percent of the company. After the show aired, John renegotiated the terms of the deal and it fell apart, Susan says. In one sense, the failed deal worked out in her favor. “I got the best of both worlds. I got the exposure,” she says. “It looked like we won and at the same time I didn’t have to give up any piece of my company.” She says John still checks in periodically to see how Freshly Picked is doing. Freshly Picked’s success was fanned with a number of celebrity endorsements along the way. Before Susan’s Shark Tank appearance, Kourtney Kardashian discovered the shoes in a cover shoot with her son Mason for the magazine Parenting. After the shoot, the Kardashian sister bought a pair herself. Today, the list of Freshly Picked celebrity fans includes Kim Kardashian, Rachel Zoe, Jessica Alba, Busy Philipps, Jamie King, Ciara, Olivia Wilde, Liv Tyler and Lisa Ling, to name a few. For Susan, going from having no money to running a multimillion-dollar company has come with some growing pains. Like in middle school, when kids grow so quickly, their body can’t keep up. It’s been kind of like that for her, but with money. For instance, until last year, she hadn’t cut herself a paycheck, wanting to keep every dime in the business. Her husband was taking home $2,500 a month at the time when her accountant told her she would need to start drawing a paycheck to the tune of $10,000 per month. “We were like, ‘What!? What are we going to do with all this money?’” she says. Success hasn’t shaken Susan’s level head. She’s working to pay off her parents’ home, set up a college fund for her kids and trying to buy homes for other family members. She treats her employees to company vacations when they reach milestones, but never gets her head too far out of the trenches. It’s almost as though she is most at home in the trenches.